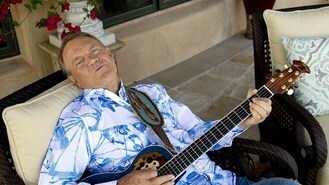 American country music star Glen Campbell has cancelled his tour of Australia and New Zealand with Kenny Rogers next month for health reasons. A spokeswoman said Campbell is not up for "the very long flight that it would require". The 76-year-old is battling Alzheimer's disease. It would have been Campbell's last international stop on his Goodbye Tour. Rogers is continuing the month-long tour, kicking off in Christchurch, New Zealand, on August 10. Australian country artists will fill in as special guests. Campbell was also scheduled to do a solo show in Brisbane, Australia. Campbell received the Recording Academy's Lifetime Achievement Award this year. He is known for dozens of hits such as Gentle On My Mind, Wichita Lineman, and Rhinestone Cowboy. Florence Welch has opened up about the vocal scare that prompted her to cancel shows in Spain and Portugal. Gary Barlow is to be celebrated with an honorary award from the music business. Madonna's concert in Poland will open with a video about the Warsaw Uprising out of respect to war veterans. Dannii Minogue has revealed she "officially became a Belieber" at the Australia's Got Talent final. The Wanted's Max George has claimed he was the "victim" of a meeting with an over-excited fan, after he was pictured kissing a mystery blonde. Sir Elton John has claimed he is able sense drugs when he goes to parties, so he can leave and avoid them. Justin Bieber has admitted that he was "definitely an accident". Drake has reportedly splashed out 7.7 million dollars on a luxurious home in California. Nelly Furtado has revealed she is currently "brainstorming" for her next Spanish album.